Antlions have many specific adaptions that allow them to be successful. Their most famous adaption is the pit the larva dig to capture prey, although most antlion species do not construct pits. Species of the genus Brachynemurus expose only the tips of their mandibles as they lay in wait for prey. The larvae burrow backwards into the sand or soil but do not construct a pit. Brachynemurus larvae use their eyes to detect passing ants and other prey. The larvae are only able to capture prey that are 0.2 mm from their mandibles. B. nebulosus will only move when it is finding a place to capture prey. 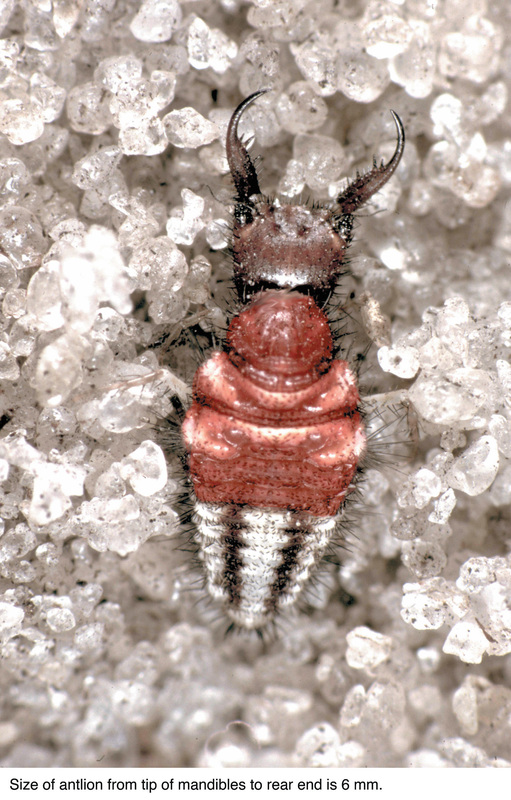 The life of an adult antlion is short lived compared to larvae, but they have many adaptions to help them be successful in their few weeks of life. Adult antlions are most active after dusk to avoid predators. During the day, they sit in a shaded area and only move when necessary. Adults are difficult to find during the day because of their opaque wings and dusky colored body. For information on how B. nebulosus obtains and handles nutrients, visit the Nutrition page.